Fuddruckers of Spartanburg celebrated a milestone anniversary with a daylong 30 Years of Celebration event on Wednesday, September 30, at the Spartanburg location. The fast-casual restaurant, located at 1509 John B. White Sr. Blvd., was opened in September 1985 by Upstate natives Allen and Lee Ann Johnston, franchise owners of The Butcher The Baker Management Co.
“We can’t imagine that it’s been 30 years already,” said Lee Ann Johnston. “We remember so many things about that special day when we first opened, and we’re still serving the world’s greatest hamburgers.” Johnston credits their success to their employees and staff. “We’ve had amazing people along the way,” she said.The Spartanburg location was recently renovated to include new furniture, new signage and a fresh look. “We offer fresh meat, fresh produce and hand-roll each bun every single day. It’s only fitting that we also keep our restaurants fresh,” Johnston said. 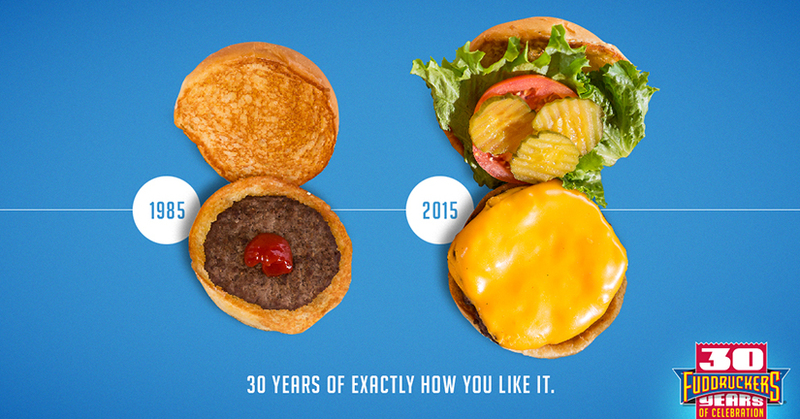 In honor of the 30th anniversary, special promotions were offered at all Upstate Fuddruckers locations. The on-site event included day-of anniversary promotions as well as games, giveaways and kids activities. B93.7 radio was present to provide entertainment. The Johnstons also received special recognition at the event from South Carolina Senator Lee Bright, South Carolina Representative Derham Cole, Jr., and Allen Smith, President of the Spartanburg Chamber of Commerce. At 30 years, the Johnstons – and the Spartanburg location – are the oldest in Fuddruckers franchise history.